Do you have any travels plan abroad? Is it a business trip or a family vacation? Whatever may be the reason, you must do proper planning for the abroad trip. One of the essential things you must consider is about the expenses. Exchanging the currency is a simple solution. But, you would certainly not prefer to carry a massive amount of cash along with you while traveling. Using the international debit or credit cards could be another solution, but there are some limits. The most fantastic option for you could be a Forex Card. These are ready to use cards. You can make payments as well as withdraw cash in foreign countries without any hassles. 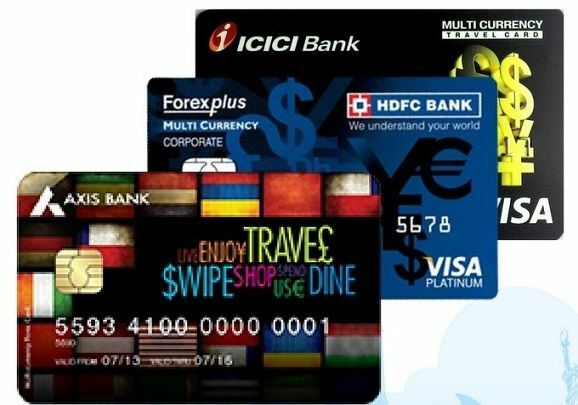 On this page, we have listed the best Forex Cards in India 2018. IndusInd Bank provides Multicurrency Forex Card for travelers who most often travel to different countries. You can load eight currencies on this card. You can use the card at more than 1.6 million ATMs and merchants in around 200 countries. There are chances of losing the card while traveling. IndusInd Bank provides an additional card or backup card in the kit which you can use if in case you lose the Primary Card. If you opt to select the single card option, you have to pay Rs 150 for the issuance fees, and if you choose the dual card, you have to pay Rs 250. Every time you load the card, you have to pay Rs 100. The bank charges 3.5% rate as the cross currency fee. The bank offers two free ATM withdrawals every month and per currency. HDFC Bank provides Multicurrency Platinum Forex Card with which you can carry 23 currencies in the single card. It charges only 2% as the currency fee which is the minimum in the industry. You can avail the Forex Card paying Rs 500 as the issuance fee. To avail the Forex Card, you don't need to have an account with HDFC Bank. Though HDFC Bank charges highest issuance fee, it offers several other benefits to the cardholders. The bank charges Rs 75 as the reload fees and Rs 100 as reactivation fees. Adding money to the Forex Card is easy via Net Banking. Axis Bank designs the Forex Cards especially for the students studying abroad and requires traveling to different countries for excursions. The students can avail discounts on airfares, university fees, travel insurance as well as cash withdrawal from ATMs. On every ECOM/POS transaction, the students get 1% cash back. The students need not pay any charge for ATM transaction. Axis Bank waives off the issuance fees as well as reloading charges. It designs two types of Forex Card for the students, i.e., Contactless Forex Cards and Image Forex Card. The cardholders can use the Contactless Forex Card by simply waiving it at any secured card reader. With Image Forex Card, you can personalize the card by adding an image of your choice. The validity of the card is five years, and you don’t need an account with Axis bank to obtain a Forex Card. The students need to pay 3.5% as the cross currency fee, and the reactivation fee is Rs 100. On every USD 5, the cardholders will earn 2 points. You can avail a minimum of 15% discount at different restaurants. You can withdraw cash from any ATM across the world. Thomas Cook is leading travel related financial service provider in India. Thomas Cook regulates two different types of Forex Cards, i.e., One Currency Card and Borderless Prepaid Card. One Currency Forex Card is a single currency card in which you can load in the USD. You need not pay any currency conversion charges with this card. The card's validity is five years, and the maximum limit of loading USD is 10000, and the minimum limit is USD 100. If you most often travel to different countries, Borderless Forex Card is the suitable option. You can load up to eight currencies in the single card. You need to pay 4.25% as the currency conversion fee. The initial loading and issuance fee for Thomas Cook Forex Card is Rs 150. You have to pay Rs 100 every time you load the card. The company offers insurance cover up to USD 10000. If in case, you lost the card, you can issue a new one without any extra charges. The Forex Card is chip and PIN enabled that turns it secure from any fraudulence. If you are traveling to a single country, ICICI Bank's Single Currency Forex Card will suit you the best. You can enjoy multiple benefits with ICICI Bank’s Forex Card. You can avail 20% discount on shopping, dining as well as specific other expenses at selected merchant outlets. You get a travel insurance cover up to Rs 1000000. Reloading the Forex Card is easy! You can get it done at any ICICI Forex Branches or through the online platform or the iMobile app. You don’t need a savings account or current account with the bank to obtain a Forex Card. You have to pay Rs 150 as the Issuance fee. The reload fee is Rs 100. You will have to pay 3.5% as the Cross Currency fee. In every 180 days, you have to pay USD 5 to reactive the card. SBI Foreign Travel Card is another good card suitable for people traveling all around the world except Nepal and Bhutan. SBI charges Rs 100 for issuance and Rs 50 for reloading. Minimum amount 200 USD can be loaded in the card. Yes Bank provides Multicurrency Travel Forex Cards which is suitable for people traveling to multiple destinations across the world. Yes Bank charges the least issuance fee, i.e., Rs 125. Charging the lowest issuance fee, Yes Bank allows adding ten currencies in the wallet. Yes Bank charges 2.75% cross currency fee which is the lowest following HDFC Forex Card. The reloading fee is Rs 100 and encashment fee is Rs 75 for every time. You don't need an account to obtain a Forex Card. You can visit the bank and request for a Forex Card. The list of benefits includes impressive discounts. The validity of this card is five years, and you can use the card for multiple times during the validity period. You get an insurance coverage up to 3 Lakhs on card loss. You can use the card in VISA and Mastercard ATMs across the world. You can use the card for online shopping across all online merchant's portals. The card automatically selects the currency as per the local currency transaction. Instead of carrying Credit cards and Debit cards on your abroad trip, it is beneficial to take a Forex Card. After comparing the benefits and facilities of the above mentioned Forex Cards, you can decide which company’s Forex Card would best suit your needs.